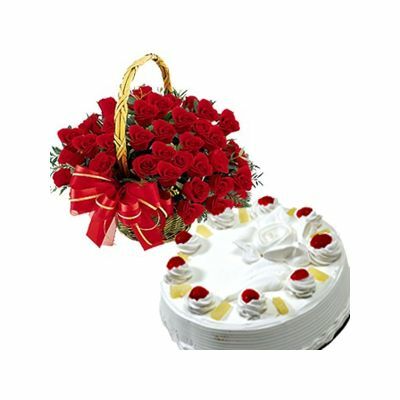 Basket of 25 red roses and rich delicious cake a perfect combination for celebrate any occasion. We have created the Special Moments Gift Hamper to make the special moments of your loved ones magical. Our Special Moments Hamper consists of a beautiful bouquet of roses and seasonal flowers and a one kg delicious black forest cake. Send roses bouquet online and surprise your loved ones with the outstanding arrangement of roses,seasonal flowers and fillers done by our expert florist. 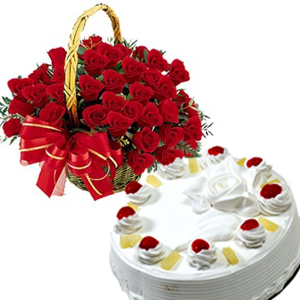 The fresh flowers and the delicious cake will surely make anyone’s day special. Send flowers to your loved ones on their anniversary, birthday and wedding day or any other occasion. You can send this gift hamper to express your gratitude, admiration and best wishes.We offer home delivery service and same day delivery service.